RVing is one of the only hobbies where you will find people talking about their bathroom business. That’s because waste is a big factor when it comes to RVing. If you aren’t connected to a sewer hookup, then an RV could be thought of like a big port-a-potty on wheels. Dealing with waste, black water tanks, and general nastiness is something that all RVers must learn. 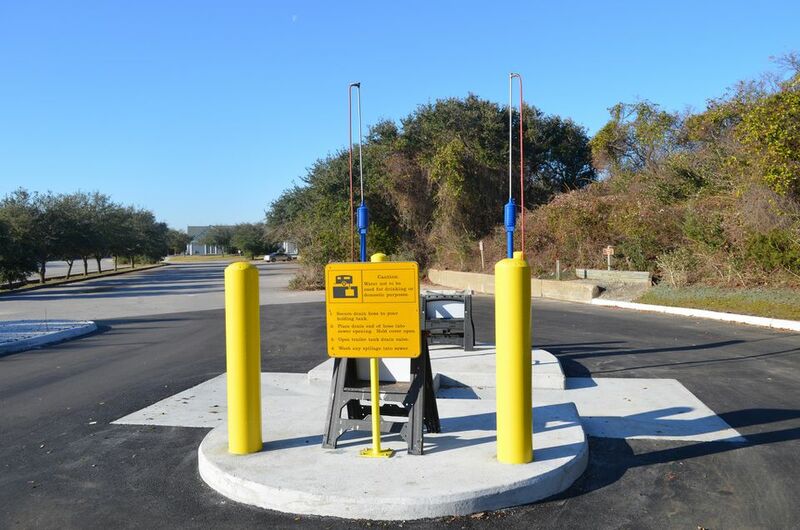 Luckily, most RV parks and campgrounds have dump stations that help make it easier for RVers to dump waste and get back on the road. To guide rookies or RVers that are camping away from parks for the first time, here’s our walkthrough on dumping RV black water tanks. The RV’s black water tank is the tank that stores waste. It’s where the water and waste go from your toilet, and if you don’t have a gray water tank, it is where all drainage goes. Black water tanks may also be known as wastewater tanks or RV septic tanks though the last one is a misnomer. Now that you know what’s going on with your black water tank let’s get dumping. Pro Tip: Trying to flush your tanks before they are at least 2/3 full is inefficient. If you want to flush your tanks but they are not 2/3 full, fill them with water until they get there to help make it easier. Pull your RV into a dump station, aim to get your black water output as close to the dump station as possible. Make sure your RV black water tank valve is shut tight. Connect your RV’s sewage hose or pipe to the proper output, on some RVs there may be separate outputs for your gray and black water tanks. Make sure you connect to the black water tank, there should be labels on the outputs such as “sewage” or “black water.” Make sure that your hose is clamped on tight with an extra ring clamp. Take the other end and connect it to the dump facility with a 45-degree pipe elbow. This makes it easier to connect the pipes and helps lessen or prevent the chance of spills. If you don’t have an elbow, make sure the hose is a solid foot down into the dump station’s waste receptacle. Once you are certain that everything is clamped down, release your black water tank’s valve. You should hear waste flowing out, let it do its business until you can no longer hear anything running through. Flush your toilet several times to help make sure all the waste is flushed out. Use your black tank cycler at this point if you have one. If you have one, now is the time to flush out your gray water tank. Always do your black water first followed by gray water. The gray water can help flush any leftover waste water out. Refill your black and gray water tanks with water and flush again if you need to or want to make sure that your tanks are completely rinsed. You can do this as many times you like. Shut off both your black and gray water release valves. Disconnect the hose from the RV then the dump receptacle. Rinse your dump hose off and the dump area if there were any spills, be careful of splatter! Return your dump hose to its proper storage area. At this point, you will need to move your RV out of the way if there are others in line. Treat your black water tank with any chemicals or enzymes that you use. Once you’ve been RVing for a while, dumping out your RV black water tanks will be no big deal. You’ll start helping others at the RV park do the same. You’ll know when you can get away with a dump and when you can’t. You’ll learn the ins and outs of your RV sewer system and get the most out of it the longer you’re on the road. Note any tips or tricks to help yourself in the future, and you’ll be an RV dumping pro in no time.